Outsourcing being all the rage these days, it is increasingly more difficult to find an area of business that has proven impervious to its lure and advances. Customer service, legal and accounting needs, administrative activities, financial, HR and IT operations, - you name it, - are all outsourced by many businesses, - large and small alike. According to Statista.com, the global outsourced services market stood at some 88$ billion in 2017, having peaked at $ 104.6 billion back in 2014. The traditionally more popular and wide-spread software development outsourcing has become so commonplace that those looking to outsource seldom pay any attention to anything other than the reliability of their provider of choice, or costs involved. For many of those, who decide to develop a complex software product, the move turns into a looming disaster from day one as there’s a lot more to the whole thing than just finding on the Web a solid-looking IT provider in a far-off and less pricey location. What do they miss to know, and what should you be aware of to receive a good product with sufficient longevity and a competitive edge? Custom software development is somewhat similar to writing a drug prescription: whatever’s good for somebody’s heartburn, may provide no cure for your snuffles. The business needs of most companies vary just as widely, as those companies do in size, product offerings, industry specifics and across a range of other criteria. It is exactly these needs, often unusual or unique, that whatever you want developed, is wrapped around. Moreover, a company’s software outsourcing needs also hinge upon how much trust they have in outsourcing as a business practice, and the extent to which this company’s own IT capabilities can fulfill their software development needs. 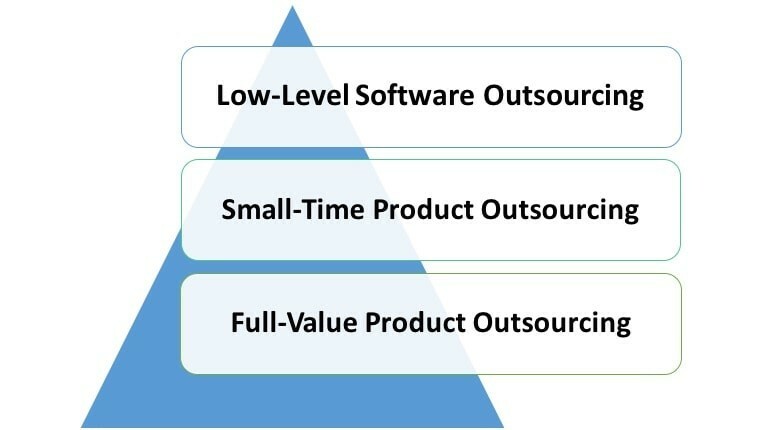 In our reckoning, the above factors’ various combinations fall under three main categories, thus forming three main types of software outsourcing arrangements. It is important to be familiar with these more typical outsourcing scenarios to be able to understand why project portfolios, case studies and friendly referrals, while being, generally, impressive otherwise, can, often, be utterly irrelevant, or, even, misleading if you want to build a complex software product. While many companies that outsource their software development needs have strong in-house teams, others uphold the belief that their core development should best be handled in-house for reasons, such as better control over the project’s implementation and better confidentiality. Their outsourced software development is never an end-to-end process. It never involves technically complicated tasks, software architecture design, ideation, or business value creation of any kind. Long story short, in most instances, these guys just need some workforce at a reduced price to handle things like bug-fixing, support, or the development of some less important part of their product’s functionality. Not all products are meant to be innovative or sophisticated. Lots of apps, whose development is outsourced, are just small-time, conventional affairs that don’t require too much skill or effort to develop. 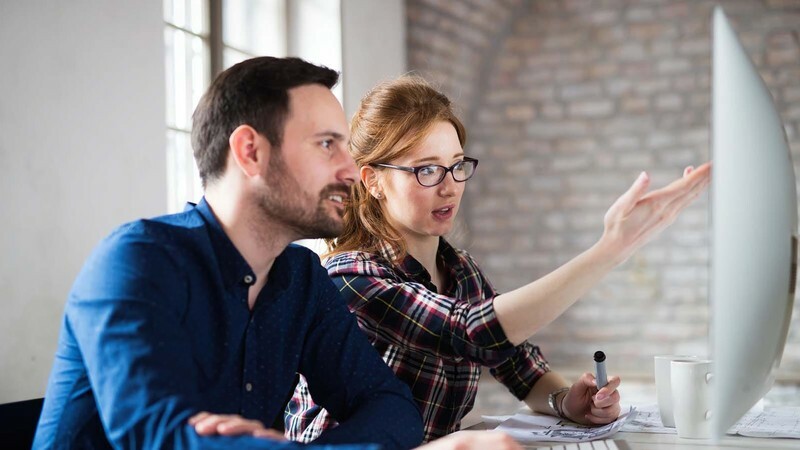 Websites, smaller eCommerce and a multitude of other business apps require neither an exceptionally good quality of the code (things like refactoring don’t, even, need to be considered), or solid Business Analysis skills. Whatever needs to be delivered as a result of such projects is, normally, a bunch of trite features, developed previously by everyone and their pooch a countless number of times. In fact, all you need to implement a project like that is a bona fide and affordable custom software provider (they are galore in places like Eastern Europe), which has several good software developers they could put at your disposal. Often, both startups and well-established businesses need to develop complex and sophisticated software applications from the ground up. Regardless of whether it is because they don’t have sufficient technical capabilities of their own, or because they are just in a different line of business, the task requires a lot more than a bunch of semi-famous client logos, collected while dealing with bug-fixing projects. Your outsourcing partner must be able to not only handle the entirety of your product design and development, but they must also be able to kick off from square one, and that would be ideation. By using their business domain knowledge, gleaned from similar projects, they must be able to adjust, and, possibly, even, further improve and enhance your business idea. A custom software provider, engaged in end-to-end product development, must also be able to gather requirements, analyze them, and design the product architecture. 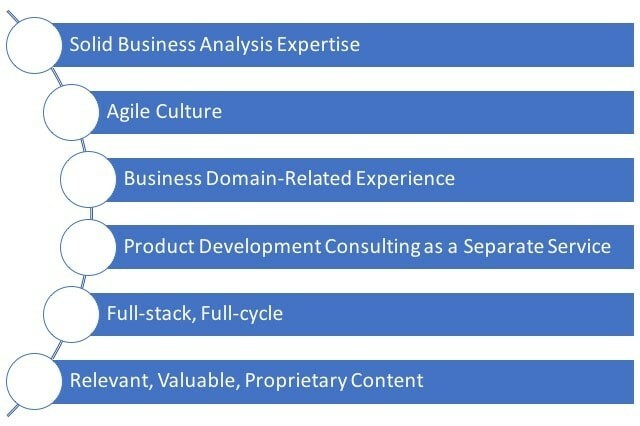 As a rule, the requirements’ gathering and analysis alone take several different kinds of Business Analysis expertise. There is no way of compromising on, or dispensing with this stage, unless you want the expansion, customization, integration, and some other abilities of your system all to be seriously at risk. Most conventional software outsourcing companies are in no position to provide this varied BA expertise, or, quite often, don’t employ any Business Analysts at all. Just like with Business Analysis, the design of complex enterprise software architecture is a difficult and skill-intensive task, which can easily be botched up by a software outsourcing provider of either of the two previous types. To make matters worse, mediocre (not to say crummy) code quality more simple apps can make do with can be death of your future system expansion: with a more complex product, it will, simply, turn the refactoring process into an all-out nightmare for your technical team. It is obvious, that only a custom software provider in possession of several mission-critical technical and analytical capabilities can help you with your product development needs, if you want to build a large-scale and complex software application. How do you identify such a provider? It is preferable that the company under consideration have proven experience in developing enterprise-grade software solutions. Ask them for Case Studies that meet the description and state their role in the implementation of the corresponding projects. It is a must for your software product development partner to have a highly professional and well-seasoned Business Analysis team. Ask them about this, as well as about the types of BA expertise they can provide. The company must have at least the 4 main types of BA expertise in order to be able to implement a major and complex software solution. A good sign of your provider’s competence would be them offering product development consulting as a separate part of their service offering. It would be highly preferable if your provider were cognizant of your business domain and had relevant business domain-related experience. The company must have a well-established Agile culture. To make sure it does, tell them you want to talk to their Team leads and Scrum masters. Try to find out how their teams are organized and managed. As a general rule, product development companies employ experts for all the positions, required by the full cycle of bespoke software development (software developers, QA engineers, BAs, PMs, designers, and technical writers). Ask your provider candidate about who their Product Owners are (although we recommend that the Product Owner be someone on your end). Check whether your provider candidate has any long-term relationships with major product-driven companies. To develop a successful large-scale software product, you should pick a company that shares their clients’ product development strategy, values and goals, and has some entrepreneurial spirit to boot. This can best be determined by the strategic, long-term client relationships they have, if any. Ask how long the company under consideration has been engaged in the provision of outsourced product development services. We believe that product development companies with no less than 5 years of experience in software product development should be given preference. Find out whether the IT company you are considering has any Scrum integration experience, associated with outsourced product development. See if your provider-to-be publishes any relevant proprietary content that can serve as evidence of their proficiency in software product development, and outsourced product development, in particular. Hopefully, the above provides some broad guidelines for how the process of choosing a software product development provider should be approached. We’ll be happy to tell you more if you drop us a line. A vast number of IT projects fail to reach their goals and result in wasted opportunities, reputational damage, and financial losses. It is, certainly, better to entrust your project to a well-reputed and seasoned software provider and keep things under control at all times. However, if your project is already under implementation and seems to be spinning out of control, you should start taking action immediately before it’s too late. How should you go about that? 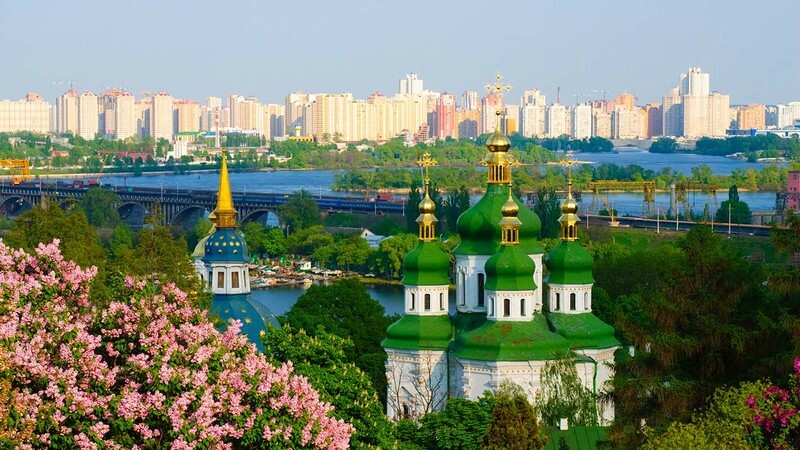 IT outsourcing to the CEE region has been on the rise for many a year now and it is increasingly popular with variously sized businesses in several continents and geographies, including Western Europe, North America, Australia, and the Middle East. 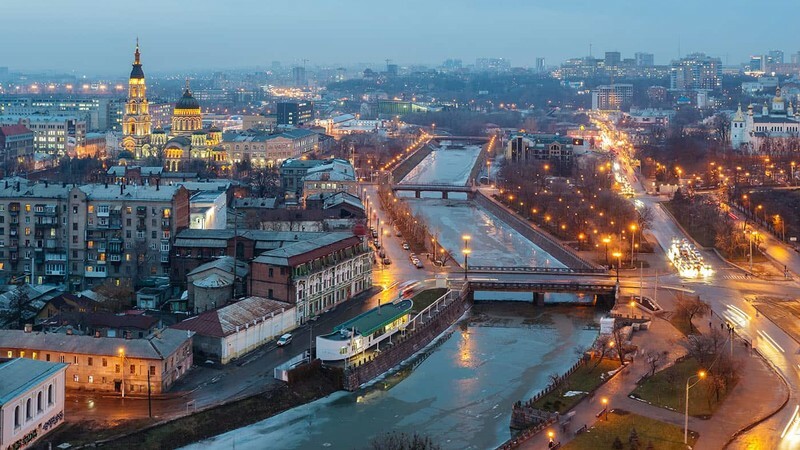 What are the underlying benefits of outsourcing an IT project to Eastern Europe? How could they help you reach your business goals? Of the many popular and attractive software outsourcing locations, there is one associated with a long-standing tradition of excellence in science and industry and the names of three Nobel Prize winners. It is a city where atom was split for the first time and one that has become part of a multitude of software development success stories.